Celebrations are marked by Central Asia’s endless debate over the color of victory ribbons. The notable absence of most Western leaders from Moscow for the celebrations of the victory over Nazism in World War II was not the only controversial issue concerning this historic anniversary. Seventy years after the day that marked the conclusion of hostilities in Europe, the banner behind which to unite has been the source of diplomatic and domestic rows, especially in Central Asia. Since 2005, the 60th anniversary of the Victory, Russian president Vladimir Putin has demanded the public display of the St. George’s Ribbon (Georgievskaya lenta). Striped in orange-and-black, the St. George’s Ribbon is now a staple of the Victory Day celebrations all across the former Soviet Union, which unites for one day to remember the sacrifice of Soviet soldiers in defeating Nazi Germany and its allies. Ironically, however, the ribbon has nothing to do with the Soviet legacy. The St. George’s Ribbon is a military symbol inherited from Imperial Russia. Even though some Soviet honorific emblems with the same pattern and colors were used in the aftermath of World War II, the colors also remained associated with the Russian reactionary forces that fought side by side with Nazi Germany, in an effort to restore the old regime. Putin’s resumption of this practice was a studied political move to revive nationalist sentiments. The symbolism of the St. George’s Ribbon flourished under the radar for almost a decade, until 2014, when it was associated with Russian nationalism in the heated conflict within Ukraine. The pro-Western EuroMaidan group decided to abandon the ribbon for the Victory Day celebrations. In solidarity with the EuroMaidan side in Ukraine, several other countries elected to avoid the use of the ribbon for the anniversary in 2014. Belarus and Latvia, in particular, discouraged and substituted the symbol with national ones. The criticism from Ukraine, however, reached also the steppe of Central Asia. In Kazakhstan, a rumor was spread around social media, that the government had banned the use of the St. George’s Ribbon on May 9, 2014. Although that proved to be unfounded, the rumor spearheaded a movement that culminated this year with the creation of Kazakhstan’s own ribbon, a blue strip dotted with the emblem of the Red Army. The Russian newspaper Pravda exposed an official letter sent across the central region of Karaganda earlier in May, stating that the use of the St. George’s Ribbon was forbidden within school premises. This, however, was not an official ban on the ribbon, as the central government never acted in this direction. The new ribbon used this year in Kazakhstan faced counter-criticism among those who wished to maintain the previous tradition, accusing Kazakh nationalists and the U.S. State Department of exploiting the opportunity in order to amend history. The State Department was brought to the fore because U.S.-funded Radio Free Europe / Radio Liberty reported on a civic action carried out by a few activists, who went to the Mayor’s Office in Almaty to hand in a petition to substitute the St. George’s Ribbon. Their argument was that the St. George ribbon “represents the Tsarist colonization of Kazakhstan”. By recalling the historical fact that brought the lands now known as Kazakhstan under the aegis of St. Petersburg and then Moscow, the activists anticipated the move by the government to create a new national symbol for Victory Day. 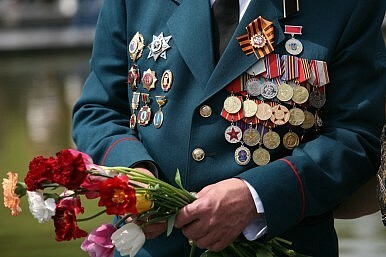 Similarly, in neighboring Kyrgyzstan, the St. George’s Ribbon could not find space this year. As announced by the Deputy Mayor of Bishkek, “this year we will use the colors of our Kyrgyz flag: red and yellow. That’s our Victory Ribbon.” The memories of colonization first and assimilation in the Soviet Union afterwards are as alive as the remembrance of the Kyrgyz who gave their life for the defeat of the Nazis. Hence, each country is finding its own national path for the display of symbols for Victory Day. It is important to note that the 70th anniversary that was just celebrated marked the first official departure of the Central Asian states from Moscow’s official line, which has become increasingly nationalistic in the past few years. Despite all disagreements, however, all five Central Asian leaders either anticipated or missed their national celebrations of Victory Day in order to be present in Moscow on May 9. It was an emblematic occasion to be celebrated together, putting aside political differences and remembering the defeat of the specter of Nazism. How Is Central Asia Celebrating Victory Day? With parades, of course, and trips to Moscow. Which Central Asian Leaders Are Attending Russia's Military Parade?South Korean President Moon Travels Across Central AsiaKazakhstan’s Top Party Picks President, Meanwhile the Youth Debate the FutureKazakh Activists Jailed For Making a Simple Statement: 'I Have a Choice'How Can Kazakhstan Revitalize Its Civil Society?